We are pleased to launch our claim-free awards initiative for Trade Risk clients. These awards will allow our clients to demonstrate their commitment to quality work and safety. Whilst the whole reason for having public liability insurance is to be able to claim when things go wrong, not having to claim can be an indicator of a business that is committed to quality work and safety. The awards will be issued based on the number of years a business has held public liability insurance with Trade Risk for, without having to lodge a claim. Given that Trade Risk was established in 2012 we do not yet have any clients who will qualify for Platinum or above. A large number of our fantastic clients will be eligible for the Gold award however, and we hope that by 2019 many of those will quality for Platinum. 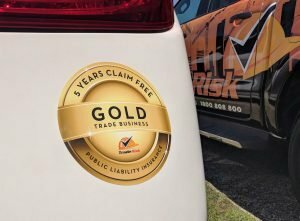 Clients who are eligible for an award will receive a sticker they can use on their vehicle, as well as a high-res digital copy which can be used on websites, social media and any other marketing materials. It is our hope that our clients will benefit from the awards, as it will give them a strong point of difference over their competitors. It will show their current and perspective clients not only that they are insured, but also that they’ve been recognised for having a number of years continually insured with no claims. Clients who achieve Platinum status will also receive a glass trophy to recognise this great achievement. From next year (2018) the awards will be issued automatically when a policy is renewed, but for now they will only be issued upon request. If you qualify for an award, please complete this form and we’ll send out the appropriate sticker and digital medal within one week. What if I’ve just had one or two little claims? During the process of creating these awards we realised that it might be a little tough to exclude so many of our clients who have had one or two minor claims over a number of years. 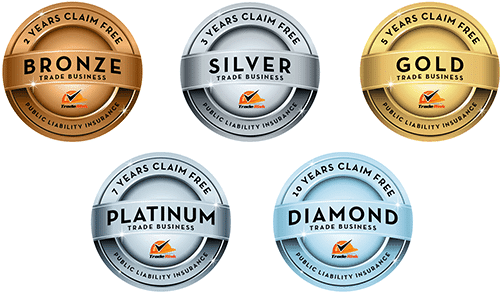 Ultimately the awards are about being claim-free, but the whole reason that you have insurance is so that you can claim when you need to. Is someone who has had one claim in five years any less worthy than someone else who’s had no claims in two years? We think not, so we are working on something to recognise our clients who fall into this category. Keep in mind that the no-claim status only relates to public liability insurance. Claims on your tool insurance or motor insurance (which are far more common) do not affect your status. Stickers are nice, but what about a discount? Unlike car and home insurance that have no-claim bonus, or no-claims discount, business insurance is quite different and has a flat rate regardless of your years in business. At Trade Risk we operate in a very competitive environment, which means we have to keep our premiums super sharp to continue growing. Keeping our premiums low means our margins are relatively low also, and ultimately that means offering further discounts just isn’t possible. We certainly hope this recognition program helps your business. At Trade Risk we’ve been lucky enough to receive a few awards over the years, and we find that using these ‘medals’ in our marketing does help to differentiate us from the competition. We hope this program can have the same positive impact on your business.